Who & What is SK58? SK58 Birders were formed in December 1992, when several local birders met and decided to pool their resources time and experience to build up and share information on local birds and bird-related issues. Members are people who live in and around SK58, i.e. 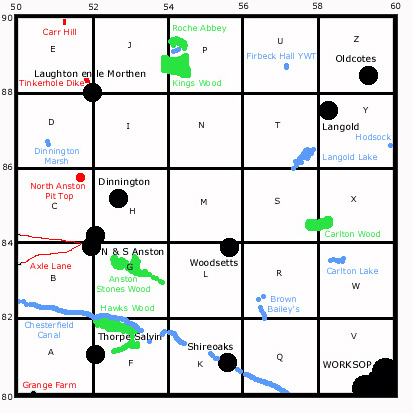 Dinnington, North and South Anston and the outlying villages, and are interested in birds, especially local birds. Members range from people who enjoy watching and feeding birds from their homes to the ardent birder, who enjoys finding and watching birds at the highest level. Membership is open to anyone who has an interest in local birds at whatever level. Membership starts from £10.00 per year. SK58 Birders are unique. 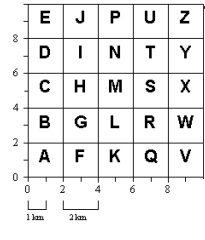 No other group concentrates on just a single 10km square. 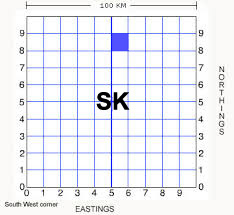 SK58 is a single 10km x 10km square between Sheffield, Rotherham & Worksop. 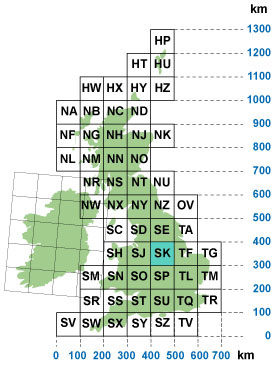 The United Kingdom is split up in to 100km x 100km squares (Fig 1); these 100km2 are broken down further into 10km x 10km squares (Fig 2). 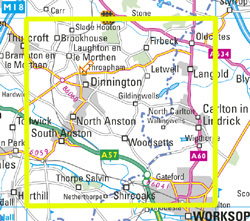 Dinnington and Anston sit almost centrally in one of these squares (Fig 3 & 4), this square is called SK58, the adjoining 10km square to the west covering the east of Sheffield is SK48 and so on and so forth. SK58 Birders are a small informal, friendly group running a full programme of events throughout the year. Monthly indoor meetings are held in the 'Loyal Trooper' public house in South Anston at 19:30 on the last Wednesday of the month, except June, July, August & December. At indoor meetings we cover a variety of topics, including local records, identification slots and a main event, this usually takes the form of an illustrated talk, from members or outside speakers. In December we run a very successful Christmas dinner. In addition to the indoor meetings we run very regular trips, to local sites and occasionally trips further afield. Members are encouraged to come on these trips, to recognise the importance of local sites, improve their identification skills and above all else, enjoy watching birds. Once or twice a year SK58 Birders run weekend trips to sites further afield. We regularly have weekends on the East Coast & Norfolk, in spring summer autumn & winter.We have in the past also run overseas trips, these have included Northern France in winter and Israel in autumn. Just before the group was formed, it was realised that no one group covered the Dinnington, Thurcroft, Oldcotes, Gateford and Todwick areas. Through the dedication and perseverance by a few very keen local birders, local and passage birds were being recorded at all times of the year in good numbers. To build up a better picture of the status of the avifauna within the area it was decided to form a group, to record and watch birds locally. Members are encouraged to submit any records of birds they see. These can come in the form of one off observations to concentrated daily observations. Each year SK58 Birders handle up to 14,000 records ranging from winter wildfowl counts to migration watches during the spring and autumn, to annual site surveys, to garden records. These records are very valuable and are instrumental when used in planning decisions within SK58. As well as recording birds on trips and walks SK58 Birders carry out national and local surveys. These include an ongoing Tetrad Atlas Survey, covering the entire square. In two 1 hour visits to every 2km square, all the birds seen and heard were noted, this was carried out in 1995 and repeated in 1996, and every two years ever since. The results of the counts are compiled and assessed, and the amazing results published in our annual report. These records and results are assessed and published in the award winning annual publication "Birds Of SK58 …" Our 1995 report won two awards. The British Birds Magazine 'Best Bird Report of the Year 1995' for a group of less than 200 members, as well as coming an astounding 5th overall, beaten only by the large county reports such as Essex, Cornwall, Norfolk. We have in successive years won the small group award. Out 1997 report would have come 2nd overall if we had produced it a few months earlier. A tremendous result for a group with 60 members. These awards pay testament to the dedication and enthusiasm of all the members of SK58 Birders. SK58 Birders are the people who are interested in your local birds, and we would very much like to meet you and anyone else you think would be interested in local birds and local birdwatching.